While complaining the other day about how cold it's been (and the spring snow!) I remembered that in a few short months it will be quite the opposite, I'll even call the subways unbearable and the idea of wearing pants will make me cringe. It certainly makes me feel much better about the current temperatures. So as I try to plan out my spring wardrobe I've been gravitating towards skirts, white ones with pretty designs in particular. As a rule of thumb, before I purchase anything new I've been trying to think of at least three different ways to wear it, like a mental version of a "currently loving". I'm all for longevity when it comes to my closet, I'm very picky, so I think this is a good way for me to judge how much wear I might get out of a certain piece. I love, love, love the broderie anglaise on this Étoile Isabel Marant skirt. It's pretty and feminine in a subtle way. (Also love this one and this one!) 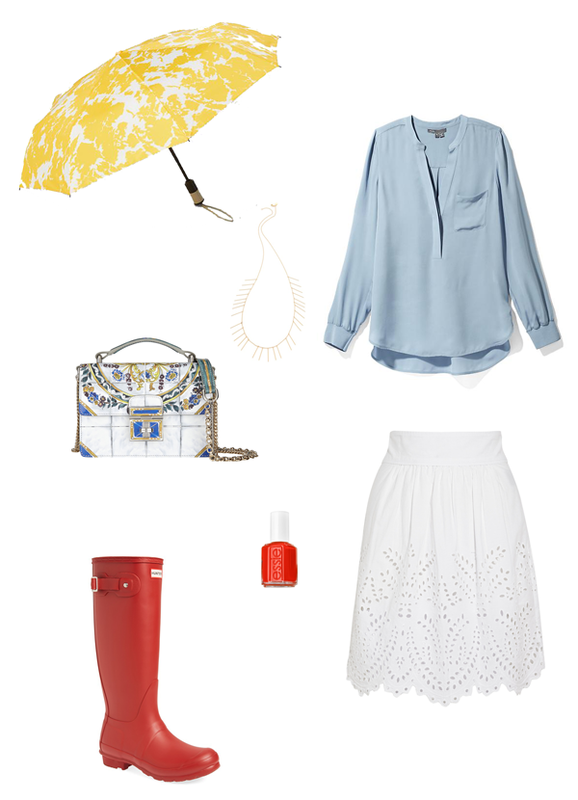 On a rainy April day I'd pair it with a silky blue top, a simple gold necklace, bright red nails, rain boots to match, and a cheerful umbrella - because, why not? I think it would look equally as cute with a red and white breton striped tee and tan sandals on seaside in July as it would with a chambray shirt and espadrilles that tie at the ankles in May. Now, I am very tempted to make a slew of April Fool's jokes but I'm going to restrain myself. Happy Wednesday everyone! Haha I was totally thinking the same thing! Its so funny too hear everyone complaining about the cold (including myself) then come July or August complaining about the heat and wishing for cooler temps. We just cant be pleased, huh? ;) That skirt is absolutely gorgeous!! It would be perfect so many ways! That skirt is seriously sooo pretty!! I love the shape and the feminine details. Perfection! Super loving the blouse and skirt! And I love the fun pop of color when people wear red hunters, it's making me want to change up from my basic black. Love this skirt!! It is so perfect for Spring and Summer. very fun post! that umbrella is darling!